If you were born 2001-2008, your tryout will be the week of June 10 th . Girls tryouts will be held Monday and Wednesday from 6-8pm. Boys tryouts will be held Tuesday and Thursday from 6-8 pm. U15, U16, U17, and U18 will tryout at Silver Street Park in New Albany. 12U, 13U, 14U, will be held at Binford Park. Please plan on attending both of your designated days. Special thanks to Mario Sanchez, Director of Youth Development with Louisville City FC, for speaking at our “Recruiting 101 Seminar”. We had over 60 in attendance. Mario shared with us a "Step by Step Guide on How to Navigate the Process" of college recruiting from his experience as a 20 year coach in NCAA Division I. Mario was nice enough to share his presentation and allow us to video it as well. This is a fantastic resource for our club and can be found below. Thank you Mario! So You Want to Play College Soccer.....Step by Step Guide on How to Navigate the Process. Registration is OPEN for all 2011 and 2012 Birth Year Rec Players! Attention all Recreational Soccer players who were born in 2011 or 2012! Are you interested in preparing for the next level of soccer? Register now for our Developmental Training Program administered by our Director of Coaching, Dutch Vigar. Five weekly training sessions beginning on April 7th. Cost is $35 (in addition to Rec fees). For more information about the program contact Dutch Vigar, dutchvigar@gmail.com. For registration questions contact Jen McFarland Kern, Sky9RN@yahoo.com. 2019 Louisville City FC discounted Single-Match Tickets are now available using Access Code: SIU at https://www.louisvillecityfc.com/siu. Tickets start at just$10. 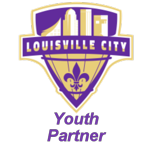 SIU is proud to be an Official Youth Partner with LouCity again this season. Our club will receive a 10% rebate for all tickets sold using our access code, 10% discount on all Louisville City FC merchandise online and 10% off entry to all LCFC camps and clinics. The club that sells the most ticketsthroughout the 2019 season will be the official Youth Partner for the first game at the new Butchertown stadium in 2020. Feel free to share our Access Code: SIU to help our club. Use Discount Coupon: SIUST at https://seatgeek.com/louisville-city-fc-tickets/ticket-packages. After selecting your seat(s), type in coupon SIUST before checkout and your discount will be added. For questions with season tickets please contact Dylan Terry at (502) 415-2195 or dterry@louivillecityfc.com. A portion of all season ticket and single game ticket sales will be donated back to SIU. Dutch Vigor, SIU Director of Coaching, and Tyler McGeorge have put together some fantastic videos for our players to work on their Ball Mastery. Thanks Dutch and Tyler! Use this below Checklist as a motivational tool to improve Ball Mastery. Players can either place a check mark in the cell adjacent to the routine description; or record a time spent on the routine. Fundamentals covered: Rolling With the Sole Roll, Draw Back Push with Laces, Draw Back Push with Inside, Draw Back-Push with Outside, Tap. Tap. Squeeze, Triple Sole Drag, Tap. Tap. Roll., Scissors Drag, Scissors Push, Step Over Drag, Inside Outside Right Foot, Inside Outside Left Foot, Inside Outside Dribble, Tap. Tap. Cut., Tap. Tap. Pivot. Fundamentals covered: Draw Back "V" with Outside, Draw Back "V" with Inside, Sole Drag, Figure 8 (Right Foot), Figure 8 (Left Foot), Figure 8 (Both Feet), Directional Change with Cut (Chop), Directional Change with Cut (Hook), Directional Change with Pivot, Step Over Chop, Step Over Hook, Tap, Tap. Scissor., Tap. Tap. Spin (Challenge). Dutch Vigar, our Director of Coaching, is excited to share the new SIU Coaching Curriculum Guide. It was developed for coaches in the club to use as guidance about what skills should be learned at each age level. Coach Vigar wants to give credit to the United Soccer Coaches curriculum guide and New York Red Bull curriculum guide, that were referenced when developing this material. A scholarship fund was established in memory of Jacob Trulock who played soccer for SIU since he was age 7. He died in a hiking accident in March 2017. Jacob was the captain of the NAHS soccer team, an outstanding student and accepted into the Purdue engineering program. The scholarship was created to help students follow their educational dreams like Jacob.